My parents are well aware of my love of horror and collecting it on home video. They're also swap meet mavens like myself, especially my father, who's been religiously trekking out pretty much every weekend for decades. They look out for things I might like on their trips and sometimes strike gold. Given the sheer amount of people selling DVDs, they find themselves at a loss knowing what I don't have or what's rare. Tapes are a bit different. Less people have them, they're easier to scan through quickly, clamshells and big boxes stick out, and sellers usually only want a buck or two a piece anyway. So when I got a call announcing that they found a few that probably weren't anything special, I still went over to check them out. They dug up exactly that. The Cult Video tapes of Creepozoids (1987), End of the World (1977), and The Day Time Ended (1980). Warner's 1990 slipcase of The Road Warrior (1981). Vidmark's Prototype X29A (1992). Nothing all that great, but they're in like new condition. Then my mom, in one of her best "pleasant" bait-and-switches ever, says "So was it worth buying these five for that one over there?" I look over and see "it" behind the glass of one of their showcases. Certainly the best tape they've ever found. Unicorn Video released a bevy of films from a variety of genres in the mid '80s on VHS and Betamax. The studio's releases are like crack to tape hoarders, especially their '70s Horror and Exploitation titles. Keep My Grave Open (1976), Grave of the Vampire (1974), The Demon Lover (1977), The Witch Who Came from the Sea (1976), A Bell from Hell (1973), Werewolves on Wheels (1971), The Night of the Sorcerers (1973), Die Screaming Marianne (1971), and Disciple of Death (1972) are all Unicorn tapes that are very rare, sought after, and command large sums on eBay. 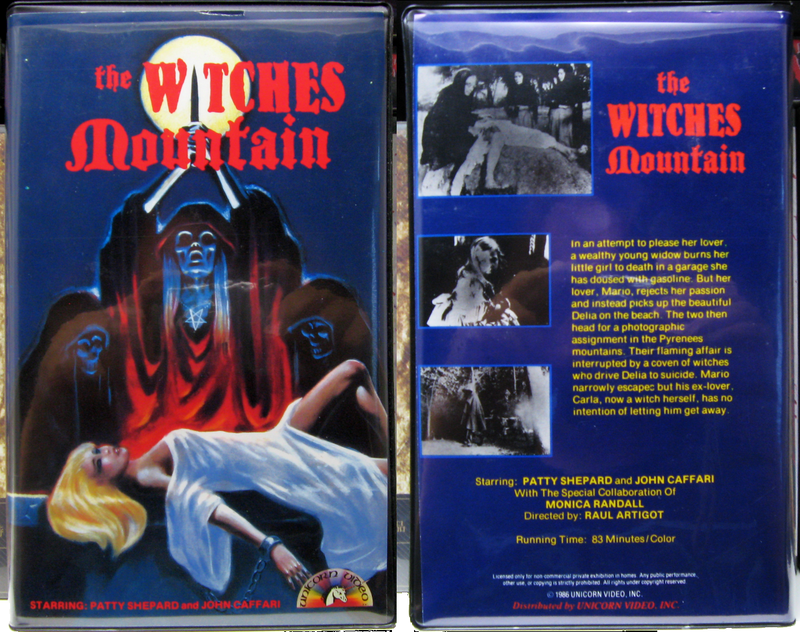 Then there's Raúl Artigot's The Witches Mountain (El Monte de las brujas) from 1972. It's not a particularly hard-to-find film being released on grey market DVDs, cheap multi-flick packs, and available through a host of rare horror DVD-R/VHS e-tailers. 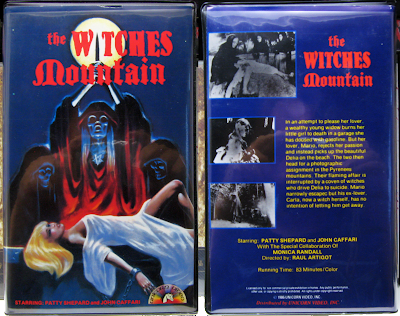 Though along with Unicorn's uncut Warlock Moon (1975), Witches Mountain is one of the distributor's most obscure releases only rarely popping up online for sale/huge bidder war. The bitchin' cover that compliments Warlock Moon's art (see here) might have something to do with its rarity. Despite this copy having a little tear on the top edge of the front--it's like new with Unicorn's 1986 factory seal intact. There isn't even any dust on the clamshell case. The seller who had this also had the other tapes above. This tape was actually sorta buried under a stack of crap according to my mother; who almost walked off before just spotting it. It was a "freebie" since she bought the other five for five bucks. Wow, just wow. I guess this proves that there are still insane finds floating around outside the combative confines of the Interwebs! I'll tell you what, the embedded clamshell may be more desirable, but that sleeve looks ten times better color wise. Here's my unfaded tape for comparison.